This really is an outstanding dish. It comes from Ottolenghi: The Cookbook, and is exactly why you can't help drooling when you walk into one of Ottolenghi's storefront restaurants in London. My husband rated it as one of his all time favorite dishes. All I can tell you is make this recipe! Whether you are making this at home or bringing it to a potluck, this recipe works beautifully because the sauce can be made ahead of time and the squash can be served at room temperature. I add pomegranate seeds, because like bacon, everything is better with pomegranate seeds. They add beautiful color, crunchy bursts of flavor and they are good for you to boot. 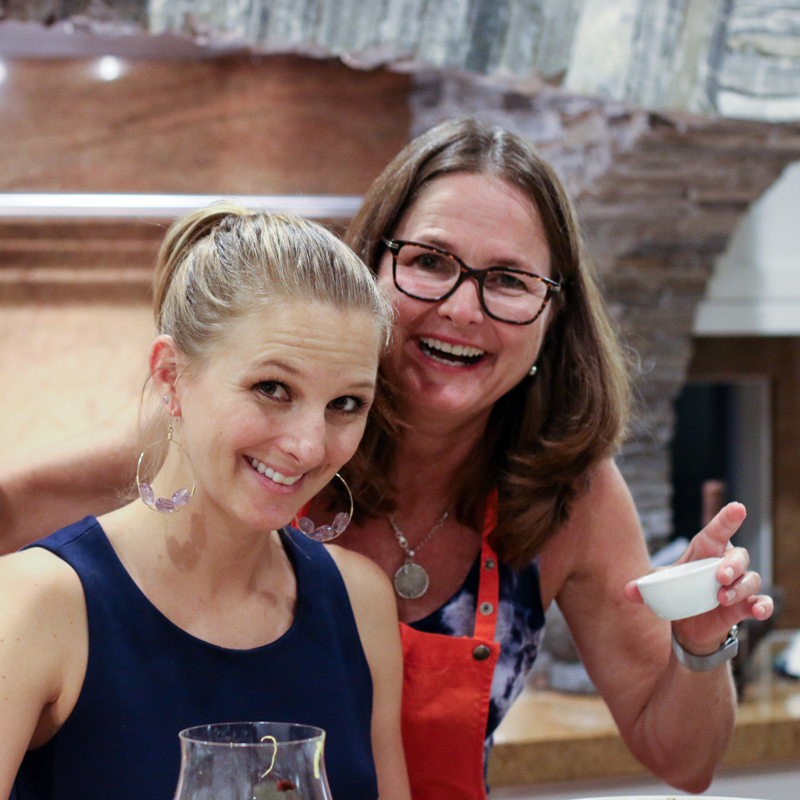 See my post on the definitively best way to seed these antioxidant wonders. The burnt eggplant and yogurt dip is really a baba ganoush without the tahini. It is so delicious that you will want to serve it with everything, from pita bread to crudités. I list this sauce as a separate recipe because it really stands on its own. This recipe can be served in many ways. As a side dish, or even a main. It makes a great appetizer if you cut the butternut squash into bite-sized chunks, put a dollop of the eggplant sauce on top and then skewer the whole thing with a basil leaf and a toothpick. Ottolenghi does it again with this beautiful, healthy, make-ahead vegetable dish that is perfect for the holidays or anytime of the year. Heat the oven to 425 degrees. Poke holes in the butternut squash with a fork. Put in the microwave for 5 minutes. Remove, let cool and slice in half. Scoop out the seeds and slice the squash top to bottom into 12 long wedges. Put wedges onto a cookie sheet. 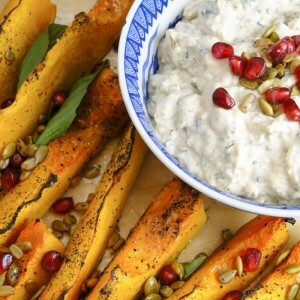 Drizzle 2 T olive oil over squash and rub the olive oil into the squash with your hands to coat all sides of the wedges. Generously season all sides of the wedges with salt and pepper. Stand the squash up so the peel-side is down and roast for 30 to 40 minutes until the squash is fork tender and has begun to caramelize around the edges. Remove the butternut squash from the cookie sheet. Reduce the oven heat to 350 degrees. Put the pumpkin seeds, sunflower seeds and almonds on the cookie sheet and toss in remaining oil left over from the roasted butternut squash. Toast in the oven for 10 minutes, stirring halfway through. 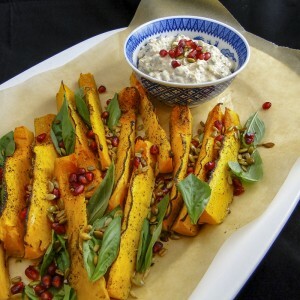 Serve squash wedges on a platter, scatter with toasted nuts and seeds, pomegranate seeds and a bowl of burnt eggplant and yogurt dip.